DETROIT/WASHINGTON -- The technology that gives cars superpowers to see around corners and through walls won’t be on the first self-driving rides hitting the road in the next few years. Vehicle-to-vehicle communication systems, known as V2V, are regarded as essential for fully automated travel, which could dramatically reduce traffic fatalities from around 40,000 in the U.S. last year. The tech enables cars to send signals back and forth to one another, improving their ability to foresee potential collisions and avert them. Despite its promise, the tech is going nowhere fast. A push by regulators during the Obama administration to speed V2V to market has stalled under the Trump administration. Without rules requiring it, automakers including Ford Motor Co. are holding off on deploying $350-per-vehicle systems that aren’t effective unless most cars have it. The race is on to get self-driving cars on the road. General Motors, Tesla, Daimler, Google affiliate Waymo and others have promised autonomous models will hit the highway over the next few years. The first ones -- expected to be robot-taxis, commuter shuttles and driverless delivery vehicles -- will be guided by sensors embedded on board the cars. Without V2V, the views from those cameras, ultrasonic and laser-radar sensors only go as far as the eye can see. V2V transponders rely on Wi-Fi and may eventually use 5G cellular signals. They aren’t constrained by obstacles like neighboring trucks or buildings. “This connectivity is like your car’s sixth sense,” said Huei Peng, director of the University of Michigan’s Mcity autonomous test track, who demonstrated this technology to Transportation Secretary Elaine Chao last week. Achieving the highest level of automation -- what auto engineers call Level 5 autonomy -- requires V2V, said Kay Stepper, vice president and regional head of automated driving for German supplier Robert Bosch. On-board sensors on current driverless cars can only sustain Level 4 autonomy, where vehicles travel in restricted areas or under limited conditions. An Obama administration proposal to equip all new cars with V2V transponders has been put on the back burner by the Trump administration. After having eased federal guidelines for testing autonomous autos and moving to slash rules elsewhere, industry executives say it’s unlikely the administration will mandate the technology. 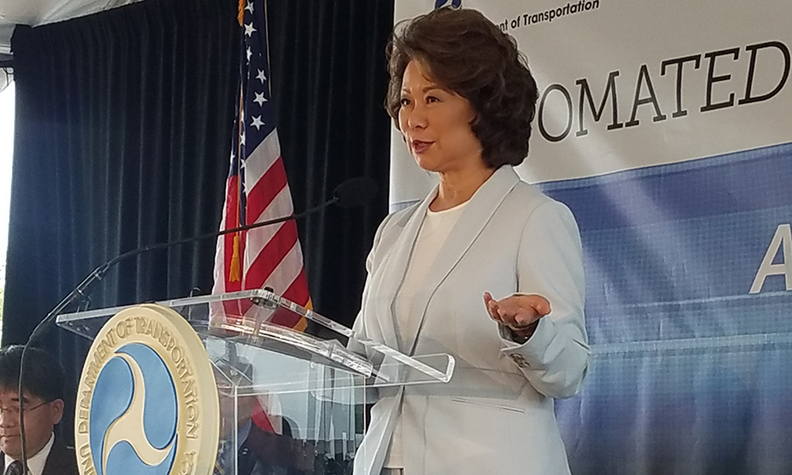 Officials from the Transportation Department declined to discuss the status of V2V regulations at the event last week where Chao unveiled updated U.S. autonomous testing guidelines. Chao suggested state and local governments bear responsibility for deploying communication devices in stop lights and road signs, though she said Trump’s plan to rebuild infrastructure will include federal incentives to encourage new tech. For now, V2V is mired in regulatory review. The National Highway Traffic Safety Administration hasn’t signaled its next step on the proposed mandate, which has been supported by safety advocates, automakers including GM, and suppliers trying to sell the systems. The National Transportation Safety Board, which last week said shortcomings in Tesla’s Autopilot system contributed to a fatal 2016 crash, reiterated its recommendation made to NHTSA three years ago that it require V2V technology. Free-market groups and other carmakers, including Tesla, have criticized a mandate in part because it could force a particular V2V tech on the industry while ignoring newer alternatives. The chasm could give the Trump administration cover to abandon the rule, as it has other Obama-era initiatives, according to Marc Scribner, a senior fellow at the Competitive Enterprise Institute, a free-market think tank in Washington.“The only action I can see would be a formal withdrawal of the rule,” Scribner said. The Obama administration’s proposal had set a timeline to install V2V technology on all cars, SUVs and light trucks by 2023, using the same federal safety standards dictating that autos have rear-view mirrors and brake lights. Some automakers are still eager to deploy the tech. GM outfitted its Cadillac CTS model with V2V communications this summer, hoping it would spur others to follow. No one has yet. “We really do need a little help from the government,” said Matthew Kirsch, GM’s engineering group manager for automated driving and active safety, who’s been lobbying federal and state regulators to gain support for the technology. A challenge for proponents of V2V is the dearth of consumer demand for tech that doesn’t work until it’s widespread on the roadways. Auto companies likely would have to bear the expense of outfitting their cars with communication transponders. “It’s all about cost,” said Kristin Schondorf, executive director of automotive and transportation mobility at consultant EY. “At the moment, there is no logical reason for a customer to pay money to put that on their car. So the return on investment is zero” for the companies. Rollout is another roadblock for V2V. With more than 250 million cars on the road in the U.S. -- and 1.2 billion worldwide -- it would take decades to outfit every vehicle with the technology. The first year of a federal mandate, new models embedded with the tech would represent only about 7 percent of cars on U.S. roads. That’s why the first deployments of V2V could come in commercial or government applications. Cities may decide to embed the devices in their stop lights and public buses. Delivery companies might embed transponders in their trucks and in roadway signs and signals along heavily traveled routes. But even those limited deployments will require rules of the road from regulators. Until that happens, V2V’s future remains in doubt.